The vendor landscape of the global market for anti-collision sensors is highly dynamic in terms of technological advancements and features a large number of companies catering to the rising demand from the thriving automotive industry across the globe, observes Transparency Market Research in a recent report. Leading vendors benefit from strong distribution networks and long-term contracts with leading automotive manufacturers. Nevertheless, an increasing number of new and small vendors continue to enter the market, indicative of the vast growth potential of the market. 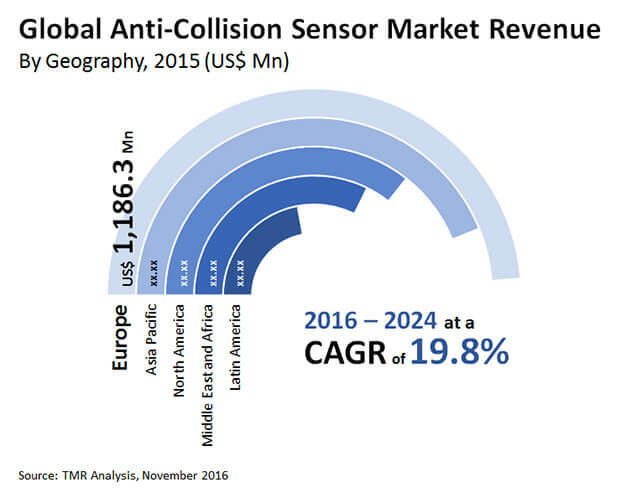 Some of the leading vendors operating in the global anti-collision sensor market are Denso Corporation, Robert Bosch GmbH, ZF Friedrichshafen, and Continental A.G.
Transparency Market Research estimates that the global anti-collision sensor market will exhibit an impressive 19.8% CAGR, in terms of revenue, from 2016 and 2024 and rise to a valuation of US$18.54 bn by 2024 from US4.36 bn in 2016. In terms of revenue, the market is expected to exhibit a 23.3% CAGR over the same period. On the basis of anti-collision sensor technology, the report segments the global market into lidar, radar, ultrasonic, and camera. Of these, radar is presently the most commonly used technology and is expected to witness rise in adoption at a healthy pace over the next few years as well. In the near future, radar technology combined with camera is expected to gain increased demand owing to optimum results. In terms of geography, the Europe market for anti-collision sensors is presently the key contributor of revenue to the global market. The presence of some of the world’s leading automobile companies in the region and the adoption of automated transportation systems in countries such as Italy, Russia, and Germany are expected to boost the influx of a variety of anti-collision sensor technologies in the region in the next few years. One of the key drivers of the global anti-collision sensor market is the staggering rise in the number of vehicles hitting roads. The continuously rising count of vehicles on the roads are leading to a rise in the number of accidents across the globe. This is a major concern, especially across emerging economies, where the lack of effective road planning and regulations pertaining to traffic rules are resulting in a significant rise in road accidents. Rising awareness in this regard and active involvement of government bodies via instigation of road safety rules and regulations are expected to drive the market for anti-collision sensors in the next few years. However, the high costs of advanced technologies are still a key concern, especially from small and medium scale automobile manufacturers. The high costs of modern anti-collision sensors also deter their adoption across companies located in or essentially serving emerging economies. The loss of revenue-generation opportunities across emerging economies could have a significant negative impact on the overall revenue of the global anti-collision sensor market as countries such as India and China are presently among the leading consumers of all kinds of automobiles.